We made this gelato to celebrate our 2 year #Noshiversary! If there’s one thing that most people remember about their trips to Italy, even more than the wine and scenery, is the gelato. Found at nearly every street corner in every village in every part of Italy, freezers filled with mounded containers of multicolored gelato are readily available for your afternoon (or morning, or evening) indulgence. While you often see unique, seasonal flavors, our measure of a gelateria’s quality is measured by one of the gold standards when it comes to flavors – stracciatella. Named for the ribbons of chocolate swirled throughout that look “torn apart,” this flavor of gelato is the Italian answer to chocolate chip ice cream…but it’s so much better. We set out on a recipe development quest to try to figure out how to make stracciatella gelato at home, with the same consistency, texture, and flavor as you get in Italy. Unlike American-style ice cream, which is a little easier to re-create, gelato is an entirely different animal. Most gelaterias have special machines that churn their gelato at a slower speed than commercial ice cream machines, making them thick, creamy, and decadent. Also, you know those massive freezers they use to hold and serve the finished gelato? Those are set to a temperature higher than most American ice cream freezers, making them ideal for serving gelato at the perfect, nearly spreadable consistency. Want to learn more about the difference between ice cream and gelato? Serious Eats has an in-depth article here. So what’s a gelato fanatic to do if you want to recreate Italian-style gelato at home without having any fancy equipment (other than a regular ice cream maker)? Make a lot of gelato. And fail at it consistently. The first one wasn’t thick enough. The second batch was too dense. The third had too little vanilla. And the fourth tasted like you were spooning up frozen less-than-skim milk. Until one day, through trial and error, we finally arrived at a perfect gelato. This recipe is a combination of several different other recipes. It uses cornstarch instead of eggs as the thickener, recommended by the New York Times. Instead of just milk, or just cream, we use half and half for the right amount of fat and creaminess. And, thanks to ice cream expert Lindsay of Scoop Adventures, it’s sweetened with corn syrup in addition to sugar for a better consistency when frozen. At the very last second, a combination of bittersweet chocolate melted with vegetable oil is drizzled into the ice cream maker, turning immediately solid (like the Magic Shell you remember as a kid). As it churns, this chocolate turns into “torn apart” shards, giving straciatella gelato its name. Instead of taking an evening stroll to the ice cream shop, imagine you’re in Italy at any moment with this creamy, dreamy recipe. Freeze ice cream maker bowl for at least 24 hours. In a bowl, whisk together 1/2 cup of the half and half and the cornstarch until no clumps remain. Set aside. Fill a large bowl with ice and cold water. Set aside. This will be used to chill the gelato base later. Scrape the seeds from the inside of the vanilla bean and add the seeds and remaining bean to a large sauce pan. Add the remaining 3 1/2 cups of half and half and whisk to combine. Heat over medium heat until the mixture is just simmering, whisking often. Remove the vanilla bean (Don’t throw this away! Rinse and dry it to make vanilla sugar). Add the corn syrup, sugar, and salt and whisk until sugar is dissolved. Bring back to a very low simmer. Remove the saucepan from the heat and whisk in the cornstarch mixture. Return the pan to the heat and continue to stir until bubbling and thickened, about 3-4 minutes. Pour the mixture into a bowl and set this bowl the reserved bowl of ice water. Stir every few minutes until cooled to room temperature. Transfer the gelato base to an airtight container and refrigerate until thoroughly chilled, at least 4 hours and up to overnight. When you’re ready to churn, melt the chocolate either in a double boiler or in the microwave and stir in the vegetable oil. Set aside. Churn the gelato base according to your manufacturer’s instructions. At the very end, drizzle the melted chocolate in a thin stream into the gelato while churning, reserving a few spoons of chocolate. It should freeze immediately and create shards. Transfer the gelato to a loaf pan or freezer container and drizzle the remaining melted chocolate on top. Cover tightly and freeze for at least 2 hours, then serve. 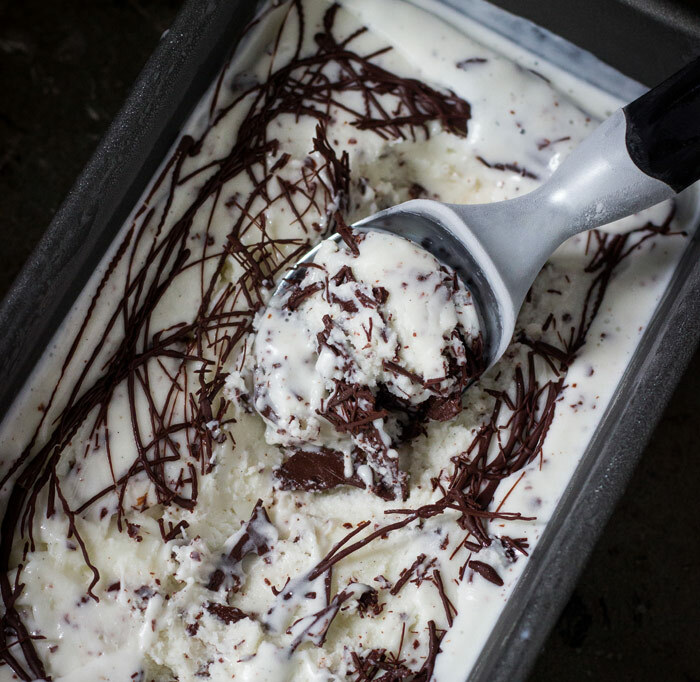 Here's a handy tip to help you make this Stracciatella Gelato recipe. So I made this… and something didn’t turn out quite right. Maybe I made a mistake, or my ingredients were somehow the same but tasted different, but it didn’t end up tasting anything like gelato/icecream. Had the texture of it, but just an off flavor.